"IGL can screen and identify all types of synthetic stones and diamond-simulants in its fully-equipped, Calgary-based laboratory." Synthetic diamonds, also known as lab-created or lab-grown diamonds, are grown in highly controlled laboratory environments using advanced technological processes that duplicate the conditions under which diamonds naturally develop in the earth's crust. Once grown, cut and polished, these diamonds look identical to natural diamonds, and are in fact chemically the same as diamonds obtained through mining. Lab grown diamonds are now readily available in colourless ranges up to 1 carat. Synthetic diamonds are also available in fancy colors that are considered very rare in nature, including popular hues of vivid fancy yellow. What is the difference between a real diamond and a synthetic diamond? It is important to note the vast distinction between lab-created synthetic diamonds and diamond simulants. Lab-created diamonds are man-made diamonds that consist of actual carbon atoms arranged in the characteristic diamond crystal structure. Diamond simulants such as cubic zirconia, moissanite, and others like coated simulants (DiamondNexus) are diamond look-alikes and are not true carbon crystals. Simulants do not have the same chemical and physical properties as diamonds and therefore simulants sell at much lower prices than synthetic diamonds. Lab grown, synthetic diamonds are grown from the tiny carbon seeds of pre-existing diamonds. Advanced technology – either extreme pressure and heat (HPHT) or a special deposition process (CVD) – replicates the natural method of diamond formation. Lab grown, fancy colored diamonds are formed when small amounts of specific trace elements are present during the growth phase of the diamond, just like in nature. How can I tell the difference between a real diamond and a synthetic diamond? 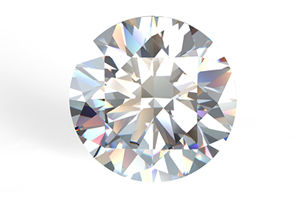 All lab created diamonds are physically, optically, and chemically indistinguishable from natural diamonds. Using professional gemological equipment, man-made diamonds are nearly impossible to differentiate from natural diamonds. The synthetic stones can only be identified with extensive scientific testing using specialized equipment. Lab created diamonds available for purchase should always come with a gem certification identifying them as laboratory-grown synthetics. Infrared FTIR Spectrophotometers For identification of synthetic diamonds and gems and treated jade, typing of diamonds, etc.